This tone of this chapter is a particularly festive one, as it calls upon the righteous among the nation to join in the joyful singing of God's praises. In the introductory verses (2-3), David specifies the particular instruments that should be used in the praise of the Almighty and urges the participants to sing and play the music skillfully. Only the highest musical standards are acceptable for the lofty task of expressing and celebrating the greatness of God. 4) His role as judge, overseeing people's conduct and judging them accordingly (13-15). In the midst of these praises, David exclaims, "Fortunate is the people that Hashem is their God!" (12). Contemplating the unparalleled greatness of the Almighty should lead us to a more profound sense of gratitude for His having chosen us as His special nation, for the unique relationship Am Yisrael has with God. In this Psalm's final verses (16-22), David expresses the logical conclusion of everything that has been said until now: that one who seeks salvation and success should rely only on the Almighty, and not on any other being. The Psalm thus ends with a brief prayer that God show us kindness in proportion to our trust and faith in Him as the sole source of blessing and joy. 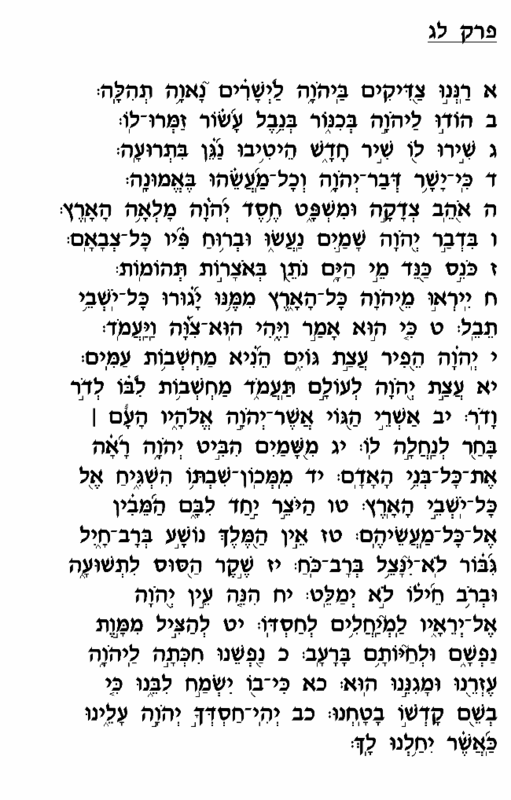 This chapter is included in the Shabbat morning Pesukei De'zimrah service, perhaps because of its very joyous and festive tenor which corresponds to the festive nature of Shabbat. 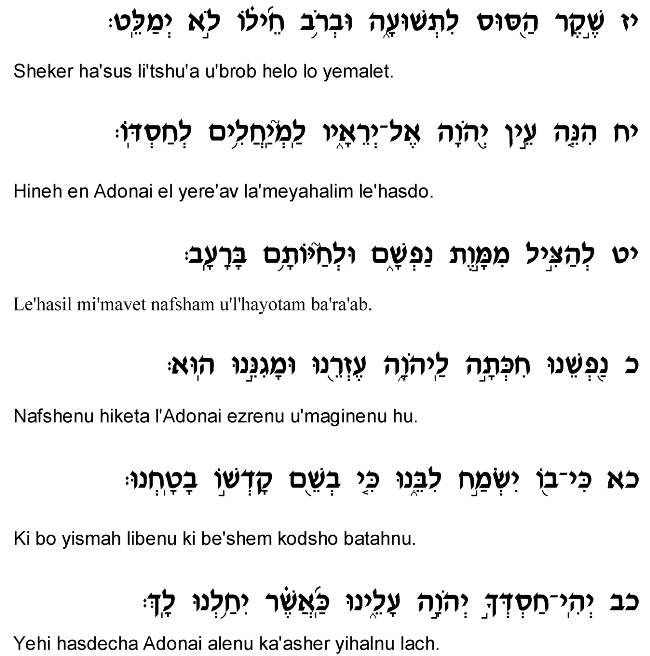 Additionally, this Psalm (as mentioned) contains a number of verses that describe God's creation of the world, which is, of course, one of the primary themes underlying the observance of Shabbat.